Dust seal set, shock absorber link, rubber only. Eight (8) piece set. 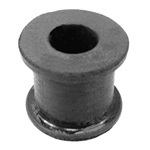 Bushing, shock absorber link, flanged at both ends. Seven eighths (7/8) inch long between flanges, one (1) inch diameter barrel. Bushing. 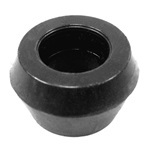 shock absorber link, smaller type. Eight (8) required per car. Compare with our #40-0069-32 (larger type).Length: .9375 inches. Width: . 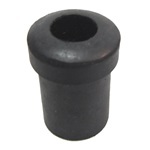 Bushing, for shock absorber link cross pin or stabilizer link cross pin.1931-36 Bushing, rubber, for shock absorber link cross pin, #41151. Bushing, shock absorber arm link. 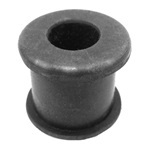 Bushing, shock absorber mounting. Double cone style, rear. 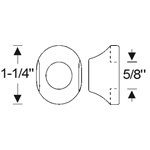 Five eighths (5/8) inch hole, one and one sixteenths (1-3/16) inch outside diameter, three fourth (3/4) inch thick. 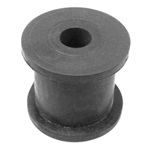 Bushing, shock absorber link. 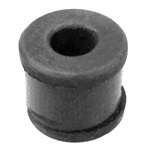 May be used for front or rear spring.Chrysler 1951-54 Bushing, rubber, shock absorber link.